If you’re frustrated that we’ve lost the first two games of the series, perhaps you can blame the ghosts at our hotel. OK, I guess you can’t really blame them, but there are many who think that the Pfister, where the team stays, is haunted. A quick google search of “haunted” and “pfister” brings up all sorts of funny stories. In fact, Rick Monday told one on the air the other night that Kenley Jansen isn’t staying at the team hotel because last year, his teammates pulled a trick on him and tied fishing wire to the curtains of the hotel so that they could make them appear that they’re moving when he got back to the room late at night. Years ago, Adrian Beltre also used to believe that the hotel was haunted and could never sleep when we were in town. Of course, since 2001 the Dodgers are 19-12 in Milwaukee, so it’s hard to blame the first two losses on the ghosts. Meanwhile, I’ve stayed there several times and never encountered any ghosts but then, perhaps they don’t mind front office folks. It’s actually a unique hotel that’s pretty cool looking so if you’re ever in town, check it out. There are a lot of moments in Dodger history that stand out for people, apart from what takes place when the ball is thrown. Today marks the 35th anniversary of such a moment. When two fans tried to set fire to the American flag at Dodger Stadium, a Cubs outfielder swooped in and stopped them from doing so. No one could know at the time that the following year, he would become a Dodger outfielder, play eight seasons for the team which included three NL pennants, several key moments for the 1981 World Championship team and then become a broadcaster for the team for nearly two decades. 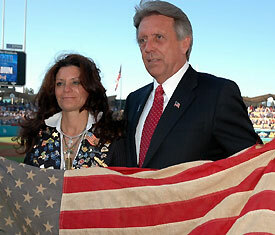 Rick Monday – a true patriot and a Dodger hero in so many ways. Happy Anniversary, Mo. You’ve represented the Dodger organization with class for more than a quarter century and did so even before you got here. Your efforts are lauded and appreciated by all of us inside the organization and millions of fans around the country. When ESPN announced that it would pick up Opening Day against the Giants, some people wondered if this meant that Vin Scully would miss his first home opener since the team came to Los Angeles. Worry no more. Vin is on board to play a role in the KABC radio broadcast on March 31 and will be in the house. Exact details of what innings he’ll call and any other role he might play in the ceremonies have yet to be determined, but rest assured, he has every intention of being here. And we’re planning a memorable ceremony that we truly hope our fans will enjoy. Today, on Veteran’s Day, everyone at the Dodger organization salutes those who sacrifice for others to make this country what is is today. There are so many great things going on around the nation today, including a really exciting event at Dodger Stadium where members of the military will be taking BP, hanging out on the field, meeting legends like Tommy and Newk and enjoying a great day at the stadium. Before that, we’ll head out to the Veteran’s Hospital in Westwood with Tommy and Vin Scully to spend some time with those who are there and thank them for their service. It’s all part of a larger program we’ll be starting in 2011 to honor the military. The Dodgers Media Network (www.dodgers.com/dmn) has a great tribute video to Dodger legend Rick Monday’s proud moment of saving the flag, while Bill Plaschke weighed in this morning with a heartfelt column as well. And while we’re saluting the efforts of others, it’s important to note that Joe Torre will host his annual Safe at Home dinner tonight in New York to benefit the great work that his foundation does to stop domestic violence, while Ryan Theriot’s inaugural celebrity golf classic is tomorrow in Louisiana to benefit three great causes (www.ryantheriot.com). On a more gracious note, thanks to everyone who contributed to ThinkCure Weekend…more than $300,000 was raised for cancer research and the online auction is still going through tomorrow. Among the things that tend to happen on a daily basis if you purchase the Insider Clubhouse Tour are interactions with numerous current and/or future Hall of Famers, access in areas of the stadium where even the most fortunate fans never get to go and a chance to watch the game from the press box. I believe last year, the person who purchased this item wound up meeting Vin Scully, Jaime Jarrin, Tommy Lasorda, Joe Torre, Ned Colletti, Fernando Valenzuela, Charley Steiner, Rick Monday and several players, among others. Trust me…we make it worth your while because it’s such a great cause so bid now before someone else gets this lifelong memory (have I talked it up enough). Tomorrow’s an off day and likely no post, but we’ll be back to posting almost daily starting on Tuesday. Hang in there, Dodger fans. It’s been a tough weekend, but the Dodgers still have the third-best record in the NL and there are still several guys waiting to hit their strides.